Here in southern Colorado, cabin fever is at epidemic levels due to low, soul-crushing snow levels that are despoiling cherished ski and snowboard trails. Attempting to keep the misery at bay, my free time is giving sway to an entirely different winter pastime — college basketball. Further impacting the change of allegiance: Watching my alma mater Colorado Buffalos cruise to an upset victory over No. 4-ranked Arizona State; seeing Butler knock off No. 1 Villanova (again! ); and witnessing Oklahoma end No. 10 TCU’s 17-game winning streak. Which is leading me to ponder: Could this be the perfect time to reshape a sow’s ear of a winter it into a whoop-whoop-whoop, ideal-climate, hoops-and-golf vacation in the Southwest? Especially with the Pac-12 Men’s Tournament playing in Las Vegas (March 7-10), the 2018 NCAA Men’s Tournament’s First and Second Round Sectional in San Diego (March 16-17), the West Regional in Los Angeles (March 22-24) and the Final Four in sunny San Antonio (March 31-April 2). Even before that, the CU Buffaloes men’s team will be cranking up the heat at several golf-resplendent locales including Los Angeles (USC, Jan. 10; UCLA, Jan. 13), Tucson (Arizona, Jan. 25) and Tempe (ASU, Jan. 27). The Lady Buffs are equally engaged, competing in Tucson (Arizona, Jan. 19), Berkeley (California, Feb. 9) and Los Angeles (UCLA, Feb. 22; USC, Feb. 24) before their Pac-12 tournament in Seattle (March 1-4). 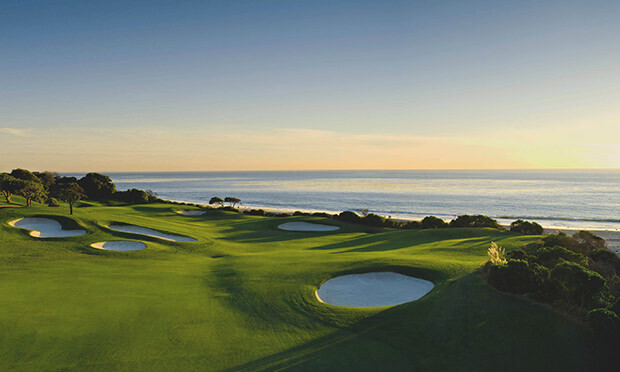 In addition to its resplendent beach scene, San Diego dishes up superlative golf resorts like the Barona Resort & Casino, Fairmont Grand Del Mar, Omni La Costa Resort & Spa, Park Hyatt Aviara, Rancho Bernardo Inn and the, as well spectacular Torrey Pines Golf Course in La Jolla and Maderas Golf Club in Poway. In metro Los Angeles, choose from stalwarts like the Monarch Beach Resort in Dana Point, The Resort at Pelican Hill in Newport Beach, Rustic Canyon in Moorpark, Trump National in Rancho Palos Verdes and Tustin Ranch in Tustin. With more than 200 courses in the Valley of the Sun, Phoenix is a wintertime paradise. Five-star golf properties include The Boulders Resort & Spa, Fairmont Scottsdale Princess, Marriott Camelback Inn, Mountain Shadows Resort, The Phoenician, Talking Stick Resort, The Westin Kierland Resort & Spa, We-Ko-Pa Resort and The Wigwam Golf Resort. Tucson’s brilliant portfolio sports Casino Del Sol Resort, JW Marriott Starr Pass, Loews Ventana Canyon, The Lodge at Ventana Canyon, Omni Tucson National Resort, Ritz-Carlton Dove Mountain and The Westin La Paloma Resort & Spa. San Antonio has earned a big-hat golf reputation with spike-tightening properties like the Hyatt Regency Hill Country Resort and Spa, JW Marriott San Antonio Hill Country and the La Cantera Hill Country Resort, plus terrific courses like the Brackenridge Park, Quarry Golf Club and TPC San Antonio. In 90-minutes-away Austin, the go-to properties include Horseshoe Bay Resort, Hyatt Lost Pines Resort and Omni Barton Creek Resort & Spa. Just leave enough playtime to tee up Wolfdancer Golf Club, Avery Ranch, Grey Rock and Star Ranch.